Raygunn Dreams Of Dream Machine! | The Arcade Archives! Raygunn Dreams Of Dream Machine! Well Ross, The Dream Machine Arcade holds a special place in my heart not just as the first arcade I worked in, but the first TRUE mall arcade I had ever been in. 3 floors of arcade goodness! Yup- dream Machine did it all right- look at those banners! 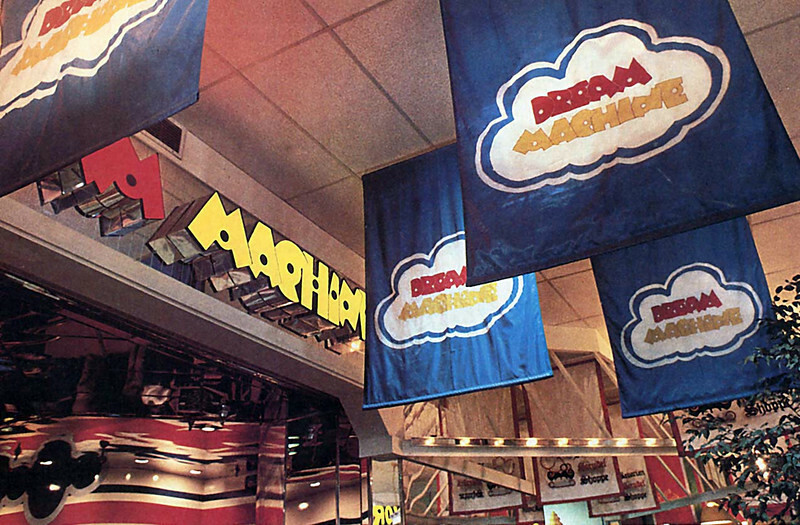 Dream Machine was established in 1973 in Massachusetts, and quickly expanded into malls all over the northeast. I had 2 near me- Dutchess Mall in Fishkill, NY, and the one that was at South Hills Mall in Poughkeepsie, NY (that expanded into two after the Park Place Roller Rink closed in 1983.) South Hills was the one I worked at. It was a bright, colorful arcade with mirrored ceilings everywhere that made it look even bigger that it was (the best part is you could see yourself playing upside down!) . 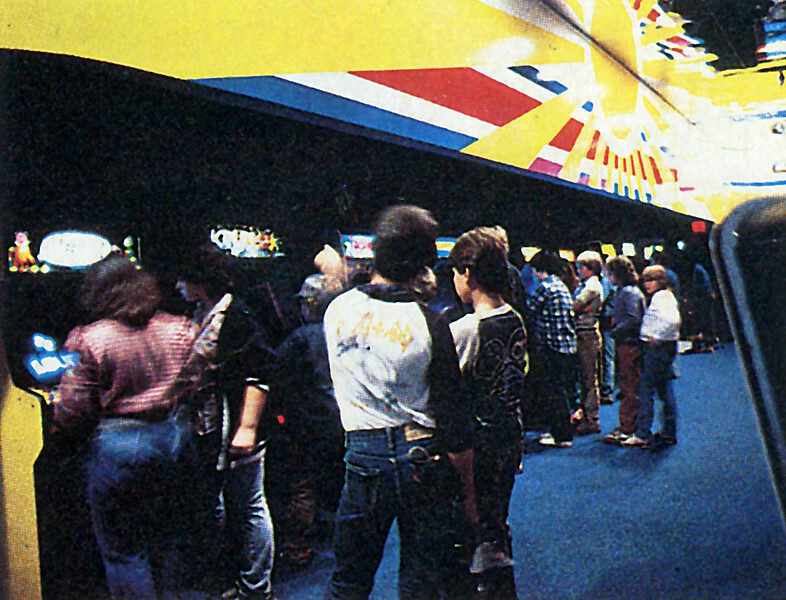 The higher walls were done in red, white, blue, and yellow line designs, culminating into the cloudburst they used in the logo on the top of the walls, near the mirrored ceiling. The walls the games were on was done in a blue, felt-like material. Silver railings with staircases were everywhere, separating the floors, and on the right side was an access ramp to take you to all three levels if you were in a wheelchair. The top level had a row of 10 to 15 pinball machines and that wrapped around to a huge row of slightly older arcade games. the second level was filled with cocktail tables (awesome for head to head competition! ) 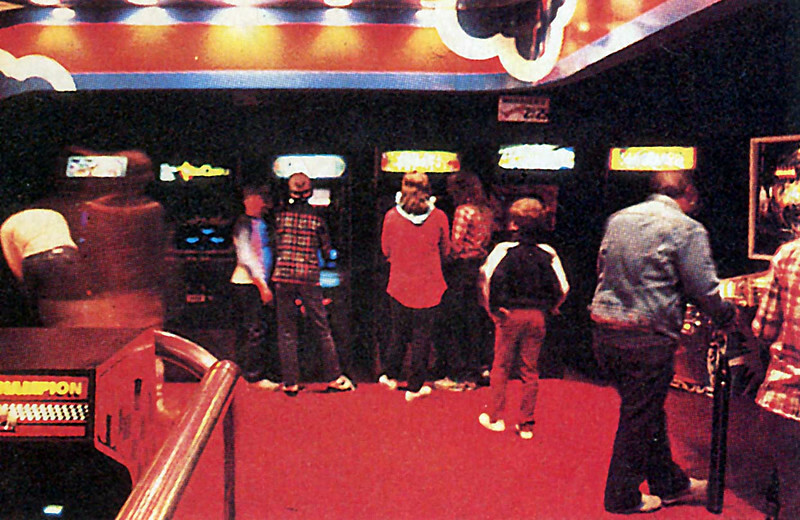 The ground floor was littered with the latest games and more recent arcade games. and of course the silver change booth (it was a title of distinction to be a change attendant in that booth!) They always got the latest and the best during the golden age (1979/83). Some games stayed forever, while some gems got overlooked by patrons and eventually discarded into history. I will eventually do regular reviews on some of those lost gems on this site! Here’s some pics I was able to find online, but sadly, I never took any myself ( it was forbidden to take pics early on- copyright issues!). So, I am putting a challenge to all the arcaders out there. send any Dream Machine pic you have to me here at The Arcade Archives and I will start a Dream Machine Tribute Page here on site for all to enjoy! Ross, thanks for the question, and the chance to dig up pics, and to fondly remember the Dream Machine as the best arcade that I think ever existed! Welcome to the Archives and KEEP PLAYIN’ LIKE IT’S 1981! I’m digging the Def Leppard concert shirt! also check out the Krull and the Q*bert with the prototype swearing header! What? no one whats to play Star Castle? And if you use 3D Arcade as your MAME frontend, wouldn’t this be a great arcade to run around in? “Hey, I was curious if you have a simple, plain Dream Machine logo, and was wondering if I would be able to use this in a year book for my high school. My dad used to work there, and if I would be able to try and get it in there, and bring it to him I’m sure he would love it.” well here ya’ go! This entry was posted in Archive Entries and tagged 1980s Arcades, Arcades, Arcades In Poughkeepsie New York, Dream Machine by raygunn1. Bookmark the permalink. OMG bro, you have such a memory as I do of that place. I can still remember going there and wanting to get a job there, but I was a youngun. My friend has a shot glass that has the Dream Machine logo on it and I would kill to get one of them things. Let me ask you, do you happen to know Darcy Kelly? She worked in the Dutchess Mall one. She also had a friend that worked in the South Hills Mall but I am unsure of her name. Thanks for posting the pics, your awesome bro! WOW! I don’t even remember the shot-glass! it must have been from the redemption period. I remember Darcy! I would love to hear from her. She probably has some great stories to tell! I used to go over to Dutchess Mall all the time (it was closer to my house) they always had the opposite games we had (we had Mr. Do!, They had Mr. Do!s Castle, we had Dragon’s Lair, they had Space Ace, etc.) And it was that very Space Ace I talk about in my first podcast- I bought it! Take a listen if you have a chance. By the way, What do you think of the site? If there’s anything arcade related you want to see up here, let me know! I have the last token I ever picked up on my last day of work at the Dream Machine. I put it in a shadowbox with many other arcade tokens from that era, but that one holds a special place in my heart. The best part of the Dream Machine at Dutchess Mall – it was right next door to the movie theater- it was open later! Do you remember the Video Connection store around the corner? they had the latest Atari games ready to play on several Atari 2600s – loved going into that store! The Movies Four! We’d hit the Dream Machine before and after a movie there – great job with the site! I LOVED Movies Four! I remember seeing Fast Times At Ridgemont High, Poltergist, Police Academy, and many more there! 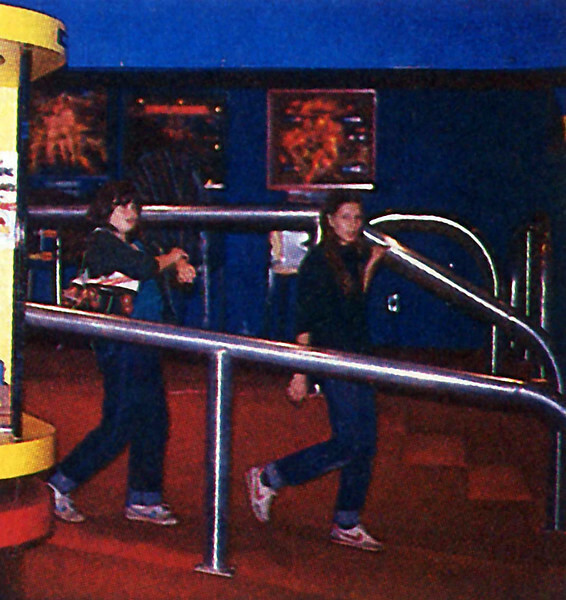 Then, after the late movie, we would stop at the Dream Machine to play a few games. After that, we would go to McDonalds out in the parking lot for a late dinner. if it was early we would go to the pizza place in the middle of the mall. Amazing times. I miss it all. I hear that the Duchess Mall is now a Home Depot. I always thought that the malls we hung out and lived our teenage lives at would always be there for our children (and us as well) to enjoy- but alas, it wasn’t meant to be. That’s why the Arcade Archives was so important to me. And thank you for the complement on the site- I put my soul and memories into it. And I hope more people will find it, read and reminisce. My hope with all of this is to get some people to submit their memories of the arcades of the 80’s here too and make it the place for mall arcade goodness! OMG, the Dutchess Mall. How many hours of my youth were spent there…. Mine too. I remember going into Video Connection, a audio/ video store (that’s what they were called back then!) and they had 8 Atari VCSs lined up with the latest game carts, ready to play! I remember vividly playing Ms. PAC- Man for the Atari foe the first time in that store! Then, going down to the pizza parlor (I wish I could remember the name) for a couple of slices, a Coke, and a game of Donkey Kong JR. And of course Movies 4! I also remember going to Service Merchandise to play the Colecovision! Awesome times!!!!! You are right! It was in the middle(ish) of the mall, on the right side going towards Service Merch from the theatre! they had GREAT PIZZA!!!! I saw Kid Niki Radical Ninja there for the first time as well. What a great place….. I remember Dream Machine before Pac- Man Or Space Invaders as well. Lots of pins, black and white monitor games, (pong clones, driving, shooting) and electro- mechanical arcade games (shooting galleries , driving simulations,) 2 games I remember were UFO and Fighter Jet. They were environmental style cabinets, where you would sit down, the seat would spin towards the slide projected enemys that you would then shoot for points. I remember the Bagel Nosh at South Hills, but the one thing I remember the most about Dutchess Mall was the Mc Donald’s in the parking lot. Funny story about that was my Dad was supposed to invest in that restaurant in 1976, but changed his mind at the last minute!!!! I still kick myself over that one! I could be rich now!!!!! I’m glad you liked it! I miss that place and time so much. I think think that might be Dan Coffey… it’s been almost 30 years and I don’t remember alot of the people it has been so long! I remember posting those certificates on the wall at South Hills! Lost Tomb- I LOVED THAT GAME!!!! wasn’t good at it though! If you don’t mind, can I post the pics up on the site? it’s funny you bring up 1983- I’m getting ready to do a major post about a particular movie about arcades that came out in ’83 that’s finally getting the DVD release it deserves! And I saw it at Movies 4 the night it opened! Thanks for finding the site, and please keep following! Hey, i was curious if you have a simple, plain Dream Machiene logo, and was wondering if i would be able to use this in a year book for my high school. My dad used to work there, and if i would be able to try and get it in there, and bring it to him im sure he would love it. Hello is this blog still going? I watched the movie wreck it ralph with my son today. I then had visions of my days working at Dream Machine. I worked there in 1984 I believe. I worked in the Dutchess Mall. My supervisor was Nancy and another one David I think. Does anyone know them? I kept trying to think of one game I liked but could never complete. I just did my research and found it was Space Ace. So cool! There was another girl I worked with that was really nice to me cannot remember her name. Yep I remember that game in fact that was the one I bought! I bought that Space Ace in April of 1985. I don’t remember the managers there because I worked at the South Hills Mall location. One of my best friends was manager at the store I worked at Steve Burtt. In fact he helped me pick that game up the day I bought it and brought it to my house. We wired in some RCA jacks to the speakers and hooked it up to my stereo! What an awesome time! I think that’s why like the movie Wreck it Ralph so much… It just reminds me of the arcade I used to work in And it shows the kids of today what it was like back then. Thanks for putting this stuff up! I worked at the Dream Machine in the North Dartmouth Mall back in ’96-97. Best job I ever had. Anyone remember the Spider-man arcade from Data-East? So cool. Wow I can’t believe the dream machines were around at that point! They had all but closed here in Florida about 1992. Like I stated before I think Dream Machines hold a special place because When all the other arcades were changing in the late 80s, Dream machine held their ground, Keeping their late 70s decor intact. It always felt Organic and inviting. Do I ever remember that Spiderman game!!! I owned one for a couple years those machines are worth a lot of money! I was like the changing perspective, But I wish Spiderman had used his webbing more, Perhaps to swing from building to building. But a great game nonetheless! Thanks again for liking the site! I had no idea that Dream Machines were that far down the seaboard. I thought they were only New England. That’s pretty cool. Thanks again for this blog, the photos are awesome. Any more? Keep Playin’ Like It’s 1981!!!! Just to let you all know Dream Machine is still open Walpole Mall in Walpole Ma and Hull Ma Nantasket Beach. All pretty much the same here still lots of fun! Hey Carol- thats great to know! I have been to Walpole Mall location- in 1984! Does it look the same at all? share some pics- I would love to put them up on the site! Thanks again – and Keep Playin’ Like It’s 1981! Hey there. Found this post randomly via Google, and had to leave a note! I worked at the Dream Machine in Old Orchard Beach, ME as well as the ones in the Lilac Mall in Rochester, NH and Fox Run Mall in Newington, NH. They’re all closed now (OOB was torn down and replaced with a hotel/condo/timeshare thing), but I spent my entire teenage working years with the company. Newington still had the mirrored walls when I left in 1997 (they were a monster to clean every night). Nice bit of memory lane you have here! That was a wonderful memory. Dream Machine was an amazing place. i was honored not just to work there, but to see its arcade history every day! Thanks for the pics and the memories. I grew up in Glenham and spent many hours in Dream Machine — and Video Connection, buying Odyssey 2 games. Also later worked at Record World in both Dutchess and South Hills Malls. I’m so glad this article brings back so many memories for so many!!! I used to love going to Video Connection!!! All those 2600 games! You could play as much as you wanted!!!!!!! Thank you!!!! If you have any arcade pics, send em’ in!!!!!! Hi! Yes,I remember Dream Machine very well. We had one here back in the day at the Dartmouth Mall in Massachusetts and now it is a TILT. I beat my first arcade game at Dream Machine: X-Men vs Street Fighter,back in 1997. I beat my first arcade game at Go Play in Belmar, NJ: Mega Man: The Power Battle. WOW! Just stumbled across this. I worked there in the SH store ’85-86 or 7… bought the old Star Wars sit down game and carted it to college. Those were good times. Wow! I was there till late ’84! You knew Steve and Charles! They were great friends of mine! Steve helped me get my first game in my house- Space Ace! Then I ended up buying an Astro Blaster, a Missile Command, and I think a Rally X from him! That began my arcade game collecting addiction!!!! Good hearing from you, and if you have any stories or pics of Dream Machine, we would love to share them here! Thanks for stopping by Curtis, and keep checking in! I grew up in Fishkill and lived at the DM @ Dutchess Mall during mom’s grocery store trips. Most days had to scavenge for quarters & free games. I have 2 DM champions club member cards, one signed by (sp?) Andre Carey and a bunch of award certificates from ’79-80, signed by Steve Rayeraft, Rick Winslow, April Geesen, Karen Klink, Dawn Levenclusky, Leslie King, K. Maynes. games included Flash, M-79 Ambush, Circus, the Grand Prix, the drop zone, Stellar Wars, Space Mission, Highway, Sinbad, Hercules (remember that giant pin?). memory lane!! Wow, what a trip! I grew up in Sixteen Acres, Springfield, MA and lived right next to (walking distance) Eastfield Mall. I spent years of my life in the Dream Machine that was in that mall. i remember it very, very well! Was my favorite place to play the games! This would have been the time frame of 1975 – 1980 or so. A LOT of tokens for sure! Good Times! Thanks for the memories! Wish I would have had a camera back then or even thought of taking pictures. I just took that amazing place for granted! ** My mom used to drag me to “Bluebird acres” CONSTANTLY (if you are from sixteen acres) – Lived past Parker street, down the hill past the gulf course – headed into Hampden! Pingback: Happy New Year 2016! | The Arcade Archives! Great stuff! I have VIVID memories of the Dream machine in the Eastfield Mall, Springfield, Massachusetts off of “Boston Road”. This was the Late seventies. I remember distinctly most of all NIGHT DRIVER (cockpit & upright as well), stunt cycles, a Sea Wolf on the second tier level, Computer Space (almost positive), Lunar Lander, Super Bug, possibly a Death Race – the rest is a little foggy. . . I remember the railings, carpet and walls too. It was located directly across from the Sacks Cinemas and an Orange Julius Kiosk in the middle. Damn, innocent times. Look at the war zones these malls have become today with the little thugged out millennial gangstas walking and trying to pull up their pants at the same time……thieving and fighting . . . . . Makes me def wanna build me my own Dream Machine in my basement and retire into some Nostalgia! Thanks for the write up raygunn1 ! A friend is looking for pics taken at the Dutchess Mall Dream Machine. I’m not from the area but he grew up there. Would like to surprise him with pics if anyone has any my email is dschomer21@yahoo.com.